Did you know that there are 500 hotel rooms booked for each vacation rental? There are many reasons for such a large discrepancy. Many families still don't understand the benefits of a vacation rental, don't feel comfortable booking a vacation rental from a person they don't know, or just aren't comfortable with the process or what they can expect. Pacific Coast Vacation Properties has worked to demystify the vacation rental process. The vacation rental market is becoming mainstream and for many good reasons. There has been a surge in the availability of vacation rentals in the past few years. Fueled by several factors including the terrible economy and the need for people to figure out how to keep their investments, many of the popular destination cities in the U.S. have had a surge in new vacation rentals. San Diego, where our business is located, is one of those cities. San Diego is unique in that it has so many different climates and geography. San Diego has as many different types of vacation rentals. Whether the rental is a quaint cabin in the mountains, a mansion in Rancho Sante Fe, or a beach house in Mission Beach, there are almost unlimited choices in rentals based on your needs. The point is that you can pick and choose your amenities and type of property based on the reason for your vacation, how many people are in your group, and exact location where you would like to be! People that have rented vacation homes before already know that you can rent a vacation home for much less than compared to a hotel. If making last minute travel reservations, you usually can find vacation rentals at a significant discount. Many people don't consider the savings they can realize when booking a vacation rental and cooking all their meals in the kitchens in the rentals they stay at versus eating out in expensive restaurants. The average size of a hotel room is 800 sq. feet! Not very big for a party of 4 people. The average vacation rental is 1100 sq. feet. with multiple rooms, kitchens, and common areas for socializing. Many properties also feature private backyards and/or outdoor areas as well. Although many hotels have great amenities such as pools, hot tubs, spas, and onsite restaurants, vacation rentals can offer even more. 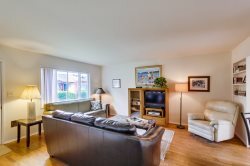 Every one of Pacific Coast Vacations Properties' rentals has great amenities such as fully equipped kitchens, beach gear such as sand toys, boogie boards, and beach towels, pack and plays and high chairs, and in many cases, bicycles to get around town. Many of our rentals have private hot tubs, pools, and other amenities found in hotels. For any amenities our properties may not have, we have resources and concierge services for all our San Diego vacation rentals. Many people that are new to vacation rentals have many concerns about booking a property. There have been many scams our there. There has been everything from people posting properties on Craig's list that didn't exist or weren't even vacation rentals to people stealing someone's identity from booking information. There are several steps you can do to make sure you book a vacation rental with confidence. First, we recommend you ALWAYS use a reputable property management company that represents owners. This protects you in may ways. You can check the reputation of the company via the web and the Better Business Bureau, can rest assured your credit card information is safe, and purchase insurance that will protect you, your family, and the furnishings in the rental in case of damage. Pacific Coast Vacation Properties goes above and beyond the steps mentioned above. We offer travel insurance which covers things such as lost luggage or car trouble. This coverage protects you from the time you leave your home until the moment you return. We also require renters to purchase Security Deposit Insurance which covers and damages to the vacation rental such as broken dishes or a TV that may just quit working. Every reservation also receives detailed information on what they can expect in our vacation rentals, directions to the rental, discounts to many local attractions, and emails about events in and around San Diego during the time of your stay. We even provide 24/7 customer support and concierge services. Guest reviews are another tell tale sign of what you will really receive when you book the property. Pay attention to the reviews about the property you are interested in! You will probably find common threads that highlight the great parts of the property. Bad reviews are important as well and , more importantly, how the owner or property manager, handled the bad review will be a key indicator of what you should expect from your stay! Vacation rentals are a great and economical alternative to hotels. Many people that stay in a vacation rental vow never to stay in a hotel again. Make sure to do your due diligence when booking a vacation rental and you will have a very rewarding and memorable experience. Next time your looking for a San Diego vacation rental make sure to look us up. We would love to have you!